Today in Masonic History Keith Jacka Holyoake is born in 1904. 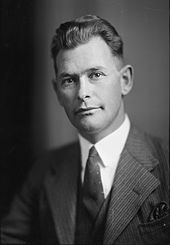 Keith Jacka Holyoake was a New Zealand politician. Holyoake was born on February 11th, 1904 in Mangamutu, New Zealand. At the age of twelve he had to leave school to run the family farm when his father passed away. His mother who had been trained as a teacher, continued her son's education at home. As a result of taking over the family farm he became associated with several farming associations. This helped to increase his interest in politics. Holyoake became a member of the Reform Party in New Zealand. In 1931 he was their candidate in the 1931 election. He lost to the incumbent. The following year the incumbent passed away in office and Holyoake was elected to the vacated seat. At the time he was the youngest member of Parliament at the age of 28. In 1935, Holyoake was re-elected to Parliament. Shortly after he was a key player in the transformation of the Reform-United coalition into the newly formed National Party. He received a great deal of respect from his colleagues in Parliament and was poised to take on a leadership role in the new party he helped form. Unfortunately boundary changes to his district caused him to lose the 1938 election. In 1943, Holyoake returned to Parliament this time for Pahiatua. In 1949, the National Party won the elections and formed the First National Government. The new Prime Minister appointed Holyoake as the Minister of Agriculture. Holyoake traveled often to England and other location around the globe seeking to maintain trade with England and open new trading partners. He served as the Minister of Agriculture for eight years. During this time Holyoake was Deputy Leader of the National Party, so when the Prime Minister was out of the country, Holyoake was acting Prime Minister. Due to this fact, Holyoake was appointed to the Privy Council in 1954. That same year he became the first person to officially be appointed as the Deputy Prime Minister. Holyoake became Prime Minister for two months leading up to the 1957 elections when the sitting Prime Minister retired due to illness. The National Party lost the election and Holyoake became the leader of the Opposition for the next three years. In 1960, the National Party returned to power and Holyoake became Prime Minister. This time it was 12 years. During his time as Prime Minister he passed the Crimes Act of 1961 which abolished capital punishment. He also sent limited troops in support to the Vietnam War. He resigned from being Prime Minister in 1972. In 1977, Holyoake was named as Governor General of New Zealand by Queen Elizabeth. He was the first and only person to be both Prime Minister and Governor General of New Zealand. Holyoake passed away on December 8th, 1983. Holyoake was the Grand Master of New Zealand in 1979.